We are controlling transmission. We will control the horizontal. We will control the vertical. We can roll the image; make it flutter. You are about to experience the awe and mystery which reaches from the inner mind to the outer limits. 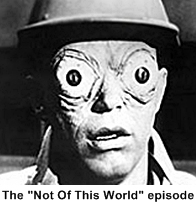 We now return control of your television set to you, until next week at this same time when the Control voice will take you to The Outer Limits. 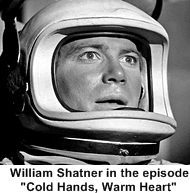 This was anthology type sci-fi series which featured a different plot line and cast every show. It attempted to base the plots more on scientific fact than fiction but it got almost as way out as its predecessor The Twilight Zone did. The series endeavored to have a social conscience by presenting shows that dealt with issues like nuclear proliferation, racism (even by aliens), big brother spying on its citizens, cloning or human engineering and the human potential for individual growth. 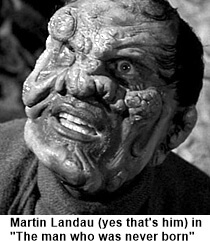 The Outer Limits had its monsters as well, ranging from rocks that transformed into spiders and ate your face off, to a hideously deformed humanoid that hypnotized everybody into thinking he was normal. The creatures were scary and kept you on the edge of your seat holding your breath until some sort of surprise ending took you totally off guard. 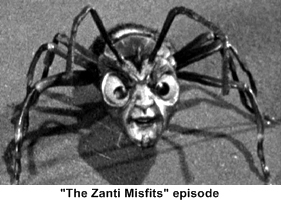 This show may have been patterned after “Twilight Zone” but its revolutionary special effects, makeup, cinematography and mind boggling writing was the new standard for the sci-fi and horror genres. 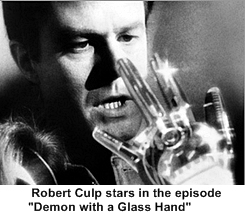 Many of the storylines and creatures were “borrowed” for use in later shows like Star Trek, Terminator, and the movie I Robot. This series opened new doors to your mind, giving the tv viewer a clear and fresh look at what seemed highly impossible but became ultimately probable. When The Outer Limits was first presented to the network the name was “Please Stand By” to tie in with the opening narrative. The Network rejected that name so they tried “Beyond Control”. 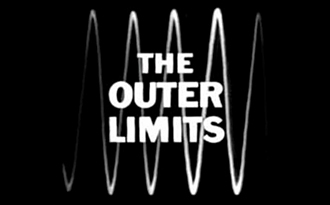 That didn’t sell either so Outer Limits was a compromise title.